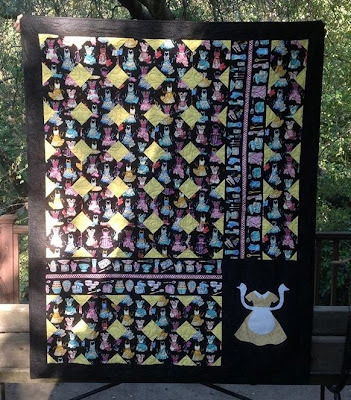 Two years ago I joined some quilters in a row quilt challenge in our guild. When I had our quilt store, some quilters participated in one that I just kind of looked at over their shoulders. I was sorry I had not been part of that group. Their finished quilts were beautiful. Each one so different. So when the chance to join one in the River City Quilt Guild came up, I jumped at it. I love to applique, so my starting row was an applique row with bees and flowers. You can see my row in the picture below. It is the center one. Each person then was to provide a row that went along with my stated theme. I did tell them they did not have to do applique, as some expressed concern in doing an applique row. In fact I didn't want all applique. I wanted piecing to offset the applique. Well you can see I got my wish. I love what each of the ladies came up with. I was so excited to put it all together and love how it came out. One lady did a row of honey jars. She was so nervous about doing applique, but they turned out very cute. Some button bees were added to sit on or near the jars and then I put the bear trying to get into the jars. The above picture is a close up of one of my flowers and bees on my row. I put a yoyo in the center of each flower. If you have a chance to participate in a row quilt with a group, take that chance. You just don't know what you will come up with. 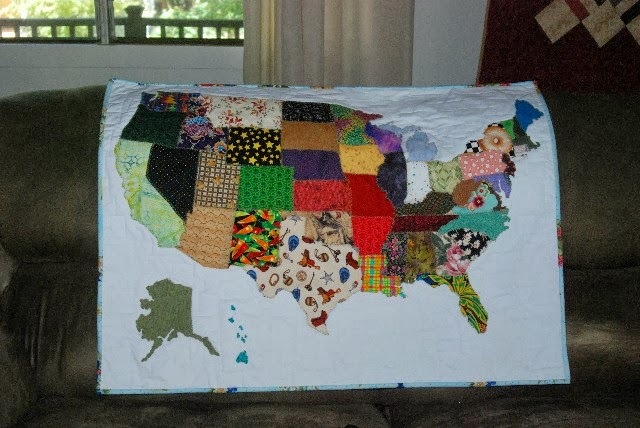 Last year my sister, Kris, asked me to make a United States quilt for her daughter, Lyndsay, who is living in England with her husband and son. Coincidentally I had seen a pattern on-line just the week before. I went back and found that quilt. It happened to be a pattern on Etsy, so I bought it. I made this quilt for Lyndsay. I'm sorry to say I didn't make two. It is always easier to make two at once than make a second one after you have finished the first. At least for me it is because I never go back and do a second quilt. Yeah. I think I will have to try this one again. It was fun to do. The best part of making it was choosing the fabrics that would represent the state. I graduated from high school in Wyoming, so it got black with gold stars. California is made from a batik, of course, with palm trees on it. Texas has cowboy boots, spurs and ropes and all things Texan. New Mexico has chili peppers. New York is made from bagel fabric because I love New York bagels! Washington state has pine trees. The only thing I would change is I did Michigan in blue, which makes it look like it is the lakes while the lakes are just part of the background. Oh well. I have not been out to very many quilt shows this year. I am very content to stay at home and do my own. There are a few that I have to attend. I love the Needle Nellies Quilt Guild quilt show. Georgetown is not far as the crow flies. Now as the road goes it is probably about 60 miles. Still not far for a quality show, but the road there is not freeway. In fact there are a lot of twists and turns. Gil and I left this morning around 10. As we drove east, up into the hills, we saw dark ominous clouds. The closer we got to Placerville, the darker they got. In fact there was moisture on the ground. Yep. It had been raining. No big deal, you say. 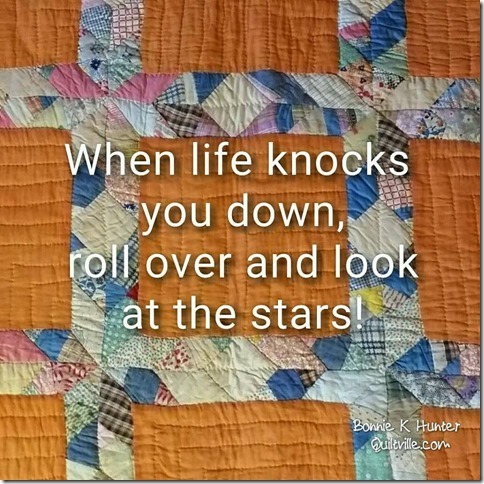 Well not if you are not headed to an OUTDOOR quilt show! We pulled into Georgetown and went to the park it is normally in. We didn't see signs. We didn't see quilts. Oh oh. It was either cancelled or they moved it somewhere. Now Georgetown is quite small, so we drove back down the main street. Sure enough there was a quilt hanging out on a corner of the main intersection with an arrow pointing on down the road. We found it! The building it was in was a nice building but very small for a quilt show. The ladies, and I'm sure several husbands, did a great job in getting them up, giving the vendors room and finding space for the luncheon area. I, as usual, have pictures to share. I just have to tell you they are all close up pictures, as the aisles between the quilts was just wide enough for one person to walk through. So some are taken at an angle. A few are taken just up close, as I was unable to get far enough back to take in the whole quilt. One, that I didn't take, was a whole cloth white quilt. Beautiful. It was quilted on a machine with some spectacular quilting. I didn't take a picture because it was a white quilt with white thread. Plus there was a bunch of admirers standing in front of it. There were several quilts using this same pattern. Each one a little different. This quilt was taken because I could step back and get it all in the picture. They were all beautiful. I had to include this one, for sure. 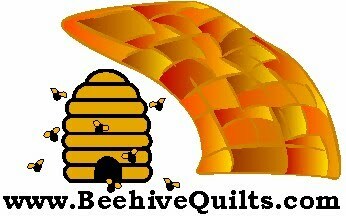 After all I am Beehive Quilts. Too cute. Again several of this pattern was done. I loved how each looked so different. Each one had adorable embellishments. Again the Quilt Diva. One of several. Real earrings. Love it. I love Halloween. I love witches. This is a cool wall hanging. Very nice. This is a beautiful quilt. Take a note how the black shines back at you a little. It is faux leather. The flowers are wool. The background is cotton. I really like how the quilter used the different kind of fabrics to get the effect. It is really stunning. The guild or a group must have had a challenge to do barns. There were several. Each one was beautiful. My husband even loved them. He said we should take some of the pictures we have taken of barns and you can make them into a quilt. Good idea, actually. Each barn is just a wall hanging. Each is a work of art though. The quilting in each one really gives you a feeling of land and wind, boards and grass. Good job, ladies. If I were to choose one over the other, which is hard, I would have to choose this one. It is hard to tell in this picture, but the mountains behind the barn are covered in pine trees that seem as real as in a picture. The lightening in the darkened sky is very realistic. Best of all is the quilt design on the front of the decaying barn. Love it. This is just a portion of a larger quilt. I took this picture to show off the blue flowers. They are squares of fabric that have been folded and sewn onto the quilt in 3-D fashion. Very beautiful. Something I may do someday. Really nice effect. I have this pattern. I have had it for at least two years. It is in my to-do box, but that is as far as it has gone. I love how she did the embroidery and then colored every so lightly inside to give the crows, hat and other items dimension. Yes, I will be doing that on mine when I get around to doing it. Thanks for the idea. Love the inner border on this quilt. Too cute all over, for that manner. The flowers are 3-D, also. Good job. I enlarged this picture more than the others, so you could maybe get an idea of the workmanship in this quilt. 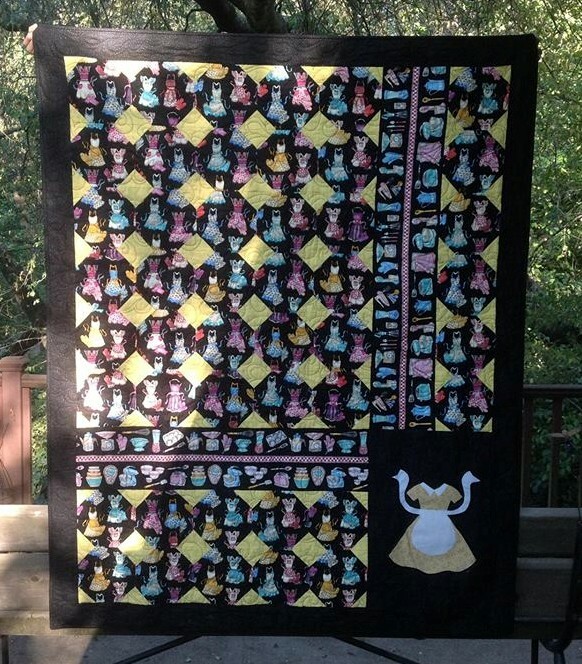 This quilt was completely done on black fabric with thread. It is stunningly beautiful. I did not vote, but if I had it would be for this very small wall hanging. The back is just as beautiful as the front. This is large quilt, but you are only seeing a very small section of it. It is all purples and pinks for all you purple fanatics. Gorgeous quilt. This table runner was on a table as you entered into the quilt room. Very cute. Love scarecrows. Owls! If you could all see my personal Pinterest posts, you would see owls, owls and more owls. I would love to own this quilt. Very adorable. Needle Nellies, it was worth the trip to into the hills. I look forward to next year's display. Hopefully the weather is more cooperative for you. Georgetown itself is a charming town to go to. It has a couple of shops that we went into, which were fun. Good luck on your celebration for founder's day tomorrow. I hope the weather is sunny and dry for you. I need to get a copy of Dr Seuss' Lorax book. I am a big fan of Dr Seuss. Green Eggs and Ham is one of my favorites. Read it often to my grandchildren. Many others come to mind, but not the Lorax. 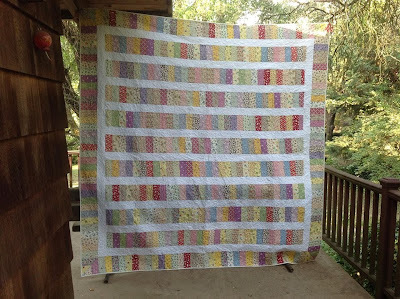 This quilt is made using a panel and coordinating fabric that came out last year about this time. Elisa, Lorena, my soon to be daughter-in-law, Martha, and I went shopping the day after Thanksgiving in southern California. Of course we had to attack a couple of the quilt shops down there. Hanging in the last one we went to was a sample of this quilt. Martha saw it and told us it was Dan's favorite Dr. Seuss book. Well we had to but the fabric. I came home and looked up the pattern on the manufacturer's website and started cutting. Hoped to get it done for his Christmas, but that didn't happen. His birthday in in April, so that was our next goal. 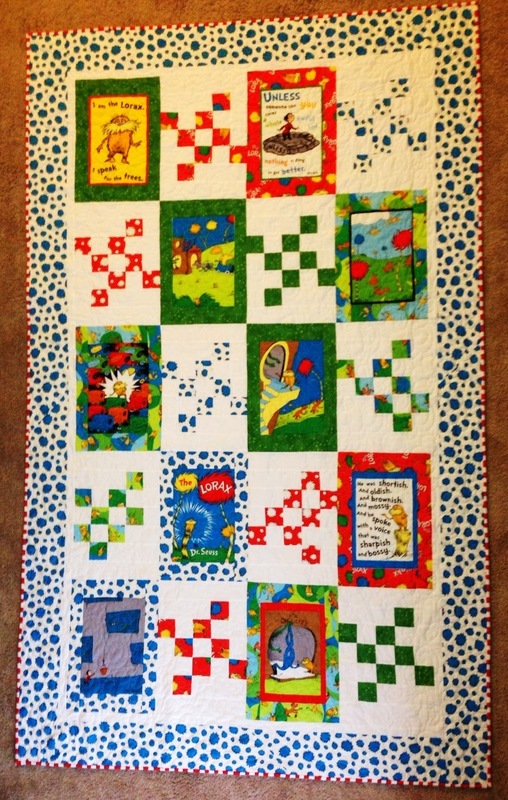 The top was pieced by me then over to Elisa it went to be quilted on her long arm machine. Done and mailed in time for him to open before he went to the mountains for his birthday. He was totally surprised. Martha said he was really pleased and amazed at it. I'm sure it will wind up being a baby quilt sometime down the road. We were happy to provide it early. This way Dan can use it to curl up in to read his favorite book. I wanted to make a quilt that would show off this adorable apron fabric. The fabric has a black background with beautiful, bright aprons. I had a yellow that was the same as the yellow in the aprons, so I used it for the corners of the snowballs.When you first look at this quilt, it is the yellow corners you see first. But as you look at it the aprons start coming out. Plus adding a large yellow apron applique in the lower right corner helped bring it all together, too. The border fabric was from the same line as the aprons and had the same colors going through it. It is a fabric that had kitchen utensils in it. It is a very busy border, so I didn't want to use too much in this already busy quilt. I like how it kind of broke up the snowball pattern and brings your eye to the large apron. It will look great on a kitchen wall. Only problem for me is my house has glass on every wall except where the oven and stove sit. So where to show it off? This was an act of love. I had LOTS of 1930 fat quarters that I had picked up here and there knowing that some day I would make a large 1930s quilt. Here it is. I cut the 1930s fabric into 3 inch strips and sewed them together. Then I cut these strips into 6 inch widths. After getting the strips the lengths I wanted, I then cut 6 inch wide lengths of white fabric and sewed that next to the pieced '30s fabric strips. I bordered the quilt with the strips of 1930s with mitered corners, which turned out quite nicely. It is 96" x 107". Elisa quilted the quilt on her long arm. It took me several weeks to break down and put it on our bed. We have a black and white border collie who likes to sleep on our bed. I was quite concerned about what she would do with it. I finally decided to put it on, but only folded at the foot at the bed. After a couple of weeks, I finally put it on the bed completely. How beautiful it looked. Then within two weeks after deciding it was a quilt to be used, my dog had an accident on it. She likes to run in the park area on our property until she is exhausted. Sometimes after doing that, she falls so sound asleep that she forgets to get up to to potty. So my new quilt had to be washed, which didn't hurt it at bit. Love it. I am so proud of it and of Elisa's quilting of it.